Common hop (Humulus lupulus): growing, planting, caring. A climber - and one of the plants used in the making of beer. 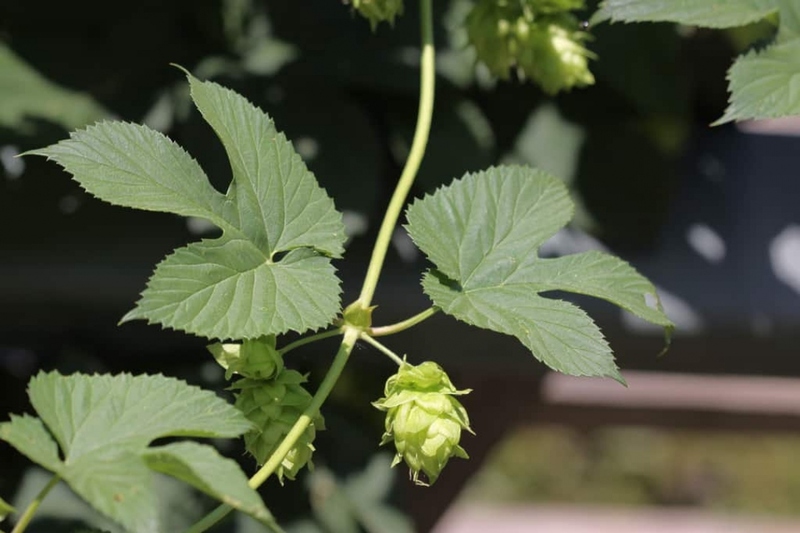 Humulus lupulus - the common hop - is a species of flowering plant in the hemp family Cannabaceae, native to Europe, western Asia and North America. It is a dioecious, perennial, herbaceous climbing plant which sends up new shoots in early spring and dies back to a cold-hardy rhizome in autumn. The female cone shaped fruits from hop are used to flavor beer, and so H. lupulus is widely cultivated for use by the brewing industry. To plant hops, you need space and support for it to climb somewhere, some draining soil, rich and well watered, with lots of light. To plant rhizomes, you must do it in autumn or early winter. Bury them 10 cm and space them 40 cm. To plant hops already developed in clods or containers: make a hole twice the size of the root ball separating the layers. Then plant, and put back the layers of soil in the right order. Tamp well around the roots until it creates a hollow. Water until water no longer seeps and form a puddle. Hops like water, as long as it is not stagnant. If you planted it in the spring we advise you to water it regularly the first month. Then water during periods of drought. Hop is a big plant, so pour at least one whole watering can, at the foot, with each watering. If your hops become too entangled or bushy, in spring you can remove some of the stems with a pruner. Do it a few weeks after the appearance of the leaves, otherwise you will see your plant dripping sap for hours. In the summer, or even in the fall, harvest your hops when you see that the cones have dried and turned yellow. Collect several times if all the cones are not ripe, because if you wait they will take a brown color and will be less good. Drying them for 12 hours at 60 ° C keeps the cones longer. Hops likes cool soil, so spread every spring a layer of mulch made of leaves or fresh compost. In the garden, hops are not subject to pests, so you should be quiet.